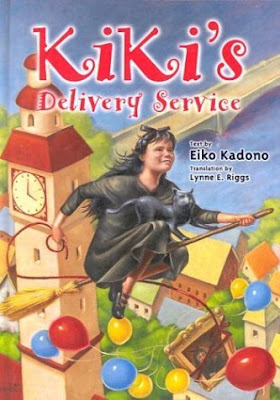 Book Adventures: (MG) Kiki's Delivery Service by Eiko Kadono + Recipes! 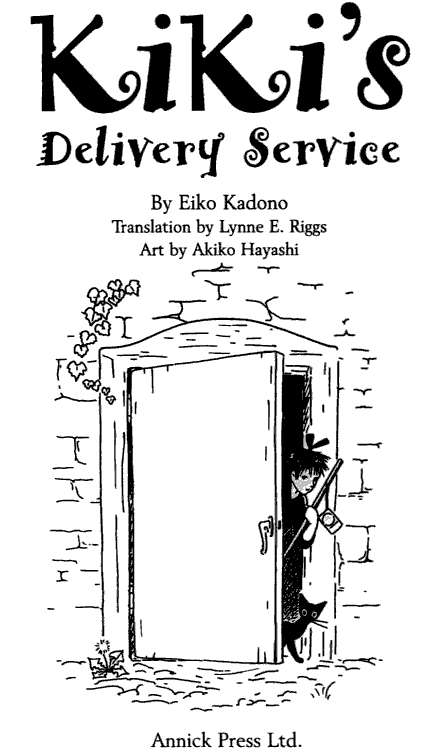 (MG) Kiki's Delivery Service by Eiko Kadono + Recipes! I recently found the paperback version of Kiki's Delivery Service at a used book sale at the Provo Library. 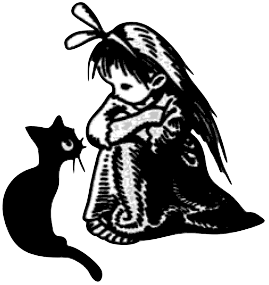 Until then I had only known "Kiki's Delivery Service" as a beautiful animated film--but this is the story the film is based on! Scroll down for book info., review, & recipes! The Studio Ghibli/Hayao Miyazaki film adaptation of Witch's Delivery Service was released in Japan in 1989. Disney released the film in America almost 10 years later in 1998 under the name "Kiki's Delivery Service", with a re-release in 2010. For a FAQ about the film and book, please click here. There has even been talk of a live-action film adaptation of Witch's Delivery Service, but who knows when or if it will come to fruition. I sure hope so! EDIT: A Japanese live-action movie based on the book has been confirmed for Spring 2014! Eiko Kadono has continued writing the adventures of Kiki and there are now 5 books total in the series. The black & white art in the books is by illustrator Akiko Hayashi. Kiki is a resourceful, spunky girl who follows her maternal tradition to be a witch. She possesses only one gift of witchcraft -- the power to fly. Like all young witches, she sets out at age 12 to find a town of her own. 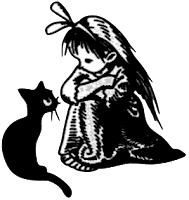 With her ever-present companion Jiji -- a cynical and faithful black cat -- Kiki departs on her broomstick and arrives at a big town near the ocean. Though nervous at first, she soon sets up a business delivering packages. Kiki meets all kinds of people and has many adventures. She befriends the thief who stole her broomstick and saves the town's traditional New Year's marathon with some courageous and timely flying. Throughout, Kiki's confidence and self-awareness grows as she learns to value her unique talents. And with Kiki's help, the townspeople realize that everyone has some "magic" that gives them their own special character and vitality. This is a charming and delightful tale that is reminiscent of children's favorites "The Worst Witch" by Jill Murphy and Astrid Lindgren's "Adventures of Pippi Longstocking." Black and white line drawings sprinkled throughout reveal the humor and warmth in everything Kiki does. 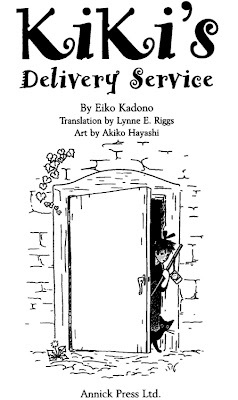 Read a preview of Kiki's Delivery Service! This is a very sweet story! The writing is simple and effective with many cute metaphors and descriptions. The book is eleven chapters of short adventures that weave together to create a whole year's picture of little witch Kiki's growth as an individual. Many of the emotions Kiki experiences are very insightful and relate-able. The theme of finding your way in the world is dealt with in a whimsical and heart-felt way. There are many similarities between the book and the movie, but also several differences. Both are beautiful works in their own right and are good companions to one another. 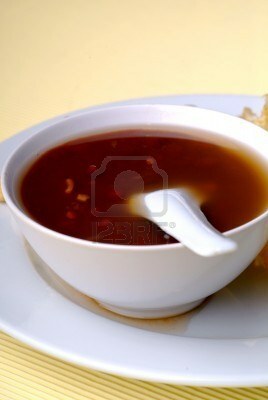 There are a few instances of biscuits and rolls, a mention of saffron tea, bean soup, and meatballs in tomato sauce. Yumm. Each food (and drink) is significant, either representing familial love or the kindness of the people Kiki encounters. Kiki is given 5 butter rolls by the town baker, Osono, as thanks for delivering a pacifier to one of Osono's customers. Osono is the first nice person Kiki meets in her new town and is a constant character throughout the book, giving Kiki advice and support. Because Osono runs a bakery, and because Kiki describes them as beautiful, I imagine her butter rolls might be like those from this recipe. Lightly grease a 7 x 11 inch baking pan. On a floured surface, roll dough into a large rectangle. Spread the butter evenly over the dough, then sprinkle on 1/3 cup sugar & nutmeg or cinnamon. 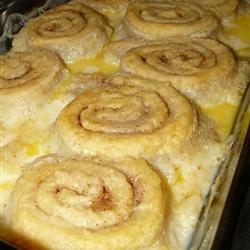 Roll up the dough jelly roll style and pinch to seal. Place the rolls in the prepared pan. In a small saucepan, heat milk, 1/3 cup sugar & vanilla until mixture begins to bubble. Pour milk mixture over rolls. Bake in preheated oven until browned & rolls are no longer doughy. As payment for her help Kiki is given a bag of homemade biscuits by an older lady who makes due with what she has. The biscuits are broken so the lady names them Stardust Biscuits. Place flour, salt, sugar and baking powder in bowl & stir to combine. Cut pieces of butter into dry mixture with fork until roughly the size of peas. Toss together gently until barely combined. When the dough holds together, turn it out on a lightly floured counter. Gently knead the dough a few times until it is a mostly a cohesive ball. 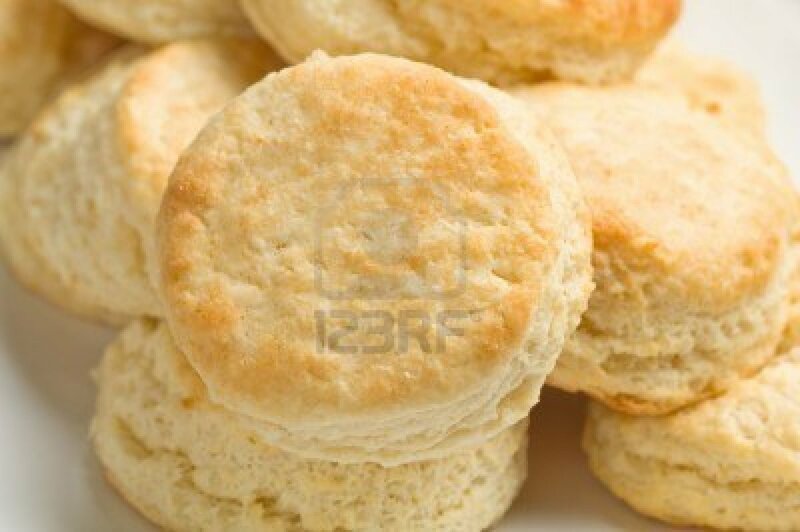 Roll the dough into a rectangle 1/2-3/4 inch thick, depending on how tall you like your biscuits. Cut into 2 inch circles, you should get about 6, & place on a parchment lined cookie sheet. Bake at 450° for 8-10 minutes. Butter and eat while still warm. In the story, because the weather has gotten cold, Kiki reminisces on having saffron tea with her mother and wishes she had paid more attention to her mother's talents. Kiki describes the tea as "thick" so I've made a milk tea version which you can find the recipe for here. Here's some information on the benefits on saffron tea. 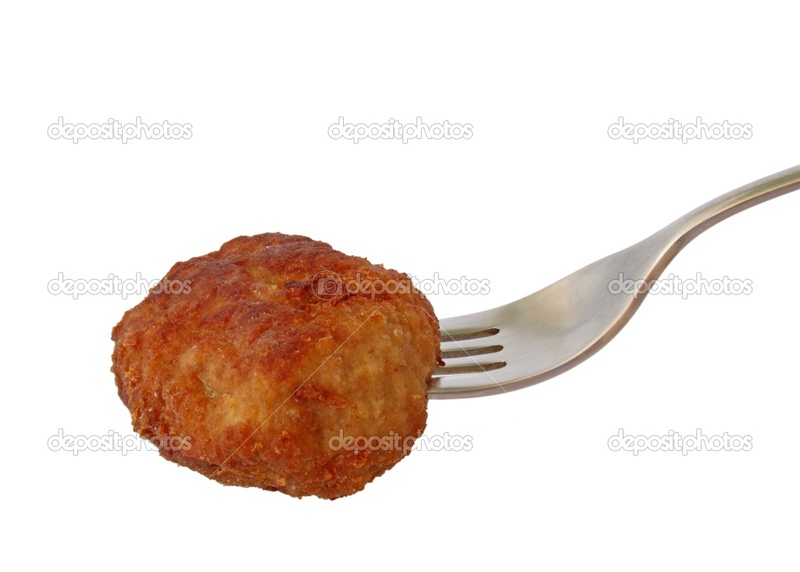 In the book, the meatballs in tomato sauce are stewed. The meal is part of her hometown's New Year's tradition. In a bowl, mix the ground beef, bread crumbs, parsley, garlic, onion, and egg. In a slow cooker, mix the spaghetti sauce, crushed tomatoes, and tomato puree. Place the meatballs into the sauce mixture. When Kiki visits home toward the end of the book, her mother is making bean soup. Kiki says this is her and Jiji's favorite meal. There is no description of what kind of bean soup so I chose one that's Japanese. Drain beans and add to crockpot along with olive oil, ginger, garlic, onion, and cumin. Cover with 2 quarts of water and cook on low for 6-8 hours, or until beans are tender. Add lime juice and cilantro prior to serving.